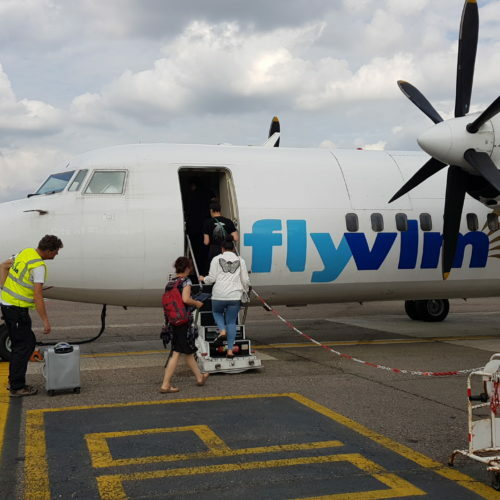 ✅ Trip Verified | Work required me to go on very short notice to London, so I decided to fly with VLM which offers you three flights per day from Antwerp to London City with their Fokker 50. 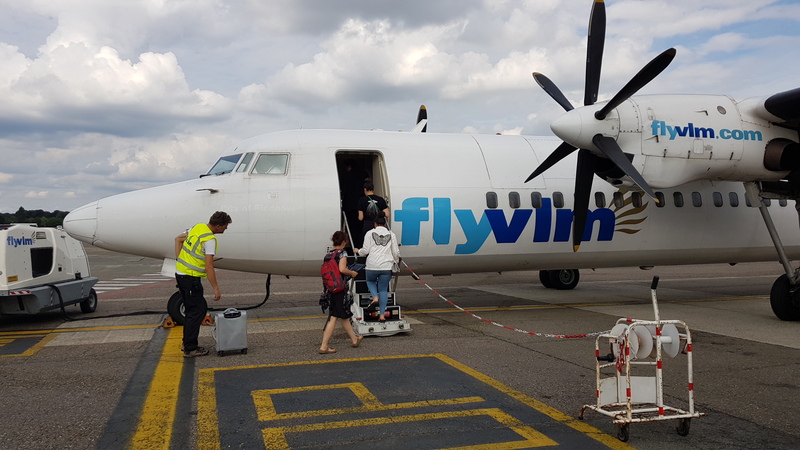 Decided as well to fly from Antwerp as they offered reasonable prices for their flights, while my usual airlines I usually take from Amsterdam or Rotterdam were extremely expensive for just flying of less than a hour. Arriving a touch early at Antwerp Airport, check-in and security were quite quiet, so it was just a matter of a few minutes to pass both check-in and security, while waiting to board (Very small airport, so don't expect much to do after security.) Once the aircraft was ready to board, it was just 15 minutes to be fully ready to start up and depart. The Fokker 50 they were using was surprisingly neat and clean from the inside for an aircraft of this age and was quite spacious to stand in the aisle. After an on-time departure out of Antwerp, the flight was quite smooth and the flight attendant started to serve us with a complimentary drink and snack of your choosing, while the flight crew kept us up to date about their procedure into London City and the estimated time of arrival, which to me was well done. Turbulence appeared into approach of London and landing was on-time. The most surprising factor of the flight was that the noise was quite low for a turboprop within the cabin. After a on-time landing, the boarding was quickly done in a safe and mannerly matter and all that was left was to wait for our luggage to arrive on our belt, which probably was the longest wait. Very poor customer service team, My flight was cancelled and I've been waiting from the of May for a refund. I was told it takes 7-10 days to be transferred into my account, I phoned 3 times to follow this up, the staff were rude on the phone, did not listen, spoke over me saying its done repeating themselves. I still have not received a refund, phoned today and spoke to the most unhelpful lady , who did not listen to my concerns and did not offer to follow it up. I asked to speak to a manager and was told there is no manager, this is obvious in the poor customer service provided by this company. "arrived on time both ways"
My wife and I flew VLM from Southampton to Antwerp return on a Fokker 50. Left and arrived on time both ways. Only about half full on way out and three quarters on the return. Had a free beer and snack. Fokker 50 is on a par with more modern turbo props on these short flights. Antwerp airport is a breeze, in a rental car and away within 15 minutes of landing. Why do we always want to fly the big airlines? VLM has the efficiency of a budget airline, the service of a high value airline and the punctuality of a German airline. They have friendly staff and after landing you are out of the airport in 5 minutes. Moreover book well in advance and you have a very attractive fare. Cabin crew fantastic as always. Have flown every week with this airline since it started in April 2015. The flights were 104 euros return. The cheapest flight now for a commuter to London is £204 euros if you book months in advance. That is 4 times the price of Ryanair. If you don't book in advance a commuter flight is well over 300 euros. It's just not worth it travel to Cork or Dublin and save yourselves thousands a year if you commute regularly. Excellent flight, more leg room than other airlines, 1 cabin stewardess who was excellent and tended to all passenger requirements, served all passengers with complimentary food with drink (which is unknown nowadays). Good old fashioned service and customers do count. Flight from Waterford VG425 7th June. RTM-HAM return in F50s. The outbound flight was delayed by about 20 mins due to high winds but the captain kept us informed. There was only one member of cabin crew on this half-full flight yet he managed two full drinks rounds in the short flying time. The return flight was relatively uneventful and arrived on time. For the return fare VLM/CityJet do offer excellent value for money with a full service in economy. LCY-EIN. The VLM brand is no more (but the ticket still stated VLM). You have to use the CityJet website planes are in CityJet livery and china and glass have been banished in favour of the bog-standard cardboard cups. I tried checking in online but there was a problem with the system. I cannot remember the last time the online check in went smoothly with VLM/CityJet. I eventually managed to do so. Passage through LCY was quick and efficient due to the extra security they've installed and the fact it wasn't a busy period but it was a bit manic at the gate as the ground staff didn't seem to know what they were doing. Consequently we left 20 minutes late. Once in the air the flight was fine (about 70% full) cabin crew managed one bar service and one tea/coffee service during the short flight and handed out Belgian chocolates (at least this VLM feature has been retained). I don't think VLM's standards have slipped due to the takeover by CityJet apart from online check in but the staff at LCY need to get their act together. LCY to ANR. Flight left late due to chaotic scenes at the gate ground staff came twice through the plane checking names against boarding cards (obviously having not done it properly first time). Flight otherwise good attentive staff good service. LCY-Antwerp unable to check in on line for no apparent reason. On arrival check in machines also refused to accept flights to Antwerp. So joined long queue to the 3 check in desks that operated for all the Cityjet flights. Eventually checked in only to find that the security queue snaked through the airport building almost to the doors! Not sure what went wrong but staff were eventually cherry picking those passengers whose flights were imminent to go to front of queue. By contrast the flight both out and back on 30th oct were smooth and uneventful.